Our MISSION: to give every person in North America an opportunity to be in charge of his/her health and efficiently heal and regenerate on their own, just as human beings were originally designed to do. We want everyone to trust the wisdom of their own body and become their own Health Boss. We at HealthBoss say, “Trust Yourself First”. Trust the innate wisdom of the body and assist it in healing without trying to control. The body is its own boss. We also accelerate, strengthen, and facilitate the process, so that the healing happens much faster and on a deeper level. The body unlocks the cellular memory and remembers at last how to heal and regenerate naturally – and this transformation affects all levels of being. To summarize, at HealthBOSS we are all about radical positive life and health transformations in the fastest way possible. “How radical?” – you may ask. We would say, to the level of complete regeneration of your body, mind, and spirit. “How fast?” – would be another question, right? Well, it depends on how deep into the degeneration cycle you are, but on average three-five times faster than any single healing technology you know can provide. And for especially inquisitive souls, who also wants to know “how positive” these transformations can be, we’ll say that we consider JOY to be the normal state of being, and until it is so for you, there is still a room for positive transformations. What makes us different from many other establishments promoting positive life and health transformations? That would be OUR TOOLS. And not just one single device, but their carefully selected combination, which we call The Healing FUSION. In the FUSION triad of Soft LASER, scenar/COSMODIC, and SOLARIS Blanket, each healing technology enhances the others producing exponential results. The amazing cutting-edge electronic equipment we work with affects a human being primarily on INFORMATIONAL level, or on the level of our PROGRAMMING. The agenda is to “clean the body’s registry” and restore our inherent healing and regeneration codes. Then our devices will address the ENERGY level “recharging the biological battery” and making the body strong enough to heal and regenerate. And finally, the PHYSICAL level will be engaged showing the changes our aching bodies so much long for. Most of our technologies come from the Space Research program and represent an actual first step towards the “Star Trek healing device” – just the way it was shown in the original series. Despite its sophistication, all our devices are extremely user-friendly, portable (most of them just the size of a cell phone), and can be very easily used for self-care and home care. Our devices will help you heal like nothing ever happened. They will regenerate your heart, your liver, your brain, your bones, and your vitality. They will take away your distress and make you younger, stronger, and happier. In Personal Wellness: The Healing FUSION will take care of the most of your daily health needs, improve your quality of life, and prevent new diseases. It will do the same for your family, friends, pets, your favorite charity, team, or your church. In Professional Practice: The Healing FUSION will complement any healing practice or modality improving results, speeding up recovery, increasing a patient flow. In Corporate Wellness: The Healing FUSION will reduce stress in a workplace, increase productivity, and make your employees much healthier and happier. In our opinion, in the 21st Century non-invasive electronic energy healing devices will replace traditional diagnosis, pills, and surgery, and we are offering a prototype of such system – The Healing FUSION. Something that every household must have in order to be well prepared and equipped for the everyday challenges our hectic life keeps throwing at us. We solve problems everyday for the Un-Insurable, with Un-Manageable or Un-Identified Conditions & Complaints. Most of our technologies come from the Space Research program and represent an actual first step towards the “Star Trek healing device” – just the way it was shown in the original series. Despite its sophistication, all our devices are extremely user-friendly, portable (most of them just the size of a cell phone), and can be very easily used for SELF-CARE and home care; even a grandma or a child can easily handle them. In this system health care is happening mostly in the households since people now can quickly take care of 85-95% of their daily health needs by themselves right away and without drugs and often even without diagnosis or surgery. All they need is an access to The Healing FUSION. Is having good equipment enough to push forward our rusty Regeneration Wheel? In our opinion – NO. We also need to know how to use our tools in the most efficient way – and we need a system to monitor the progress (unless we have a system of measuring our progress, how do we know that we are even making progress?). So, we developed a unique Virtual Training and Support Program for our clients that can take them from the beginners’ Fast Start Track all the way to the advanced techniques used by the best practitioners in the field. You will not find a similar training system for our technologies anywhere in the world – this is the ONLY comprehensive Virtual Training out there. There are many other aspects to us, just as there are many facets to a diamond. But the most powerful and beautiful thing about HealthBoss is not our miraculous devices, or our training system, or even our virtual team in 7 different cities – it is our COMMUNITY. 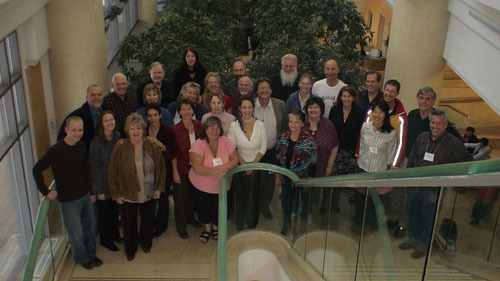 We do not gather in person often, just once a year for our HealthBoss University LIVE conferences. Yet when we do, it is always an event to remember; a place where you receive a new knowledge – and a charge of positive healing energy supporting you for a long time. See for yourself HERE – and if you like what you see, join us for the next one! We have a vision, a dream of every person on the Planet finally welcoming his/her own body, learning it, understanding it, taking care of it, and closing that mind-body gap that we all have; treating the body as a precious vessel that is given to us to enjoy this life in all its appearances. And we see every household having our Star Trek tools (and maybe better ones as time passes by) to quickly help the body fix its problems. This is not to eliminate the existing healthcare system; it’s to complement it, in parallel. To unburden emergency rooms. To eliminate waiting lists. It’s to shift a focus from practitioner-oriented medicine to client-oriented. It’s to restore the balance in Nature – and to heal the world. Sorry, Rosendo, LET Medical (the manufacturer of your device) treat their devices on an individual basis and will only accept for repairs the devices legally sold through their authorized distributors. Maxwell or NuGen are not authorized LET Medical distributors – and we can’t help you because you didn’t buy your device through us. The best we can do is to forward your message to LET Medical and ask them if they would consider accepting your device for repair directly from you bypassing your seller. If they agree, we can send your device to Russia on your behalf with our own repairs, unless you would like to do it yourself. If you wish to proceed that way, please let us know at support@healthboss.org. Thank you. I am familiar with the principles in “The Secret”. They are very empowering. They came from an earlier group of teachins, several or many years before The Secret was written. I forget the name right at this moment. It will come to me soon. It was expensive, and was so popular, that all psych professionals and students wanted one. It was hard to find, and sold out as soon as they came in. The Secret is almost identical to this published manual. Maybe, from the early 90’s. I remember it well. Even before this was a marvelous book by a Father Joseph Murphy, which was a short version of similar principles, and a great read, and great suggestions to follow. His was published even earlier than the 90’s. It might still be found on amazon.com, or in second hand book stores. I am a retired professional counselor, and advocate positive thinking, always. I also followed the teachings of Joseph Murphy, who was also of another kind of belief, besides Catholic, possibly Muslim. There were many positive psychologists and psychiatrists then, and earlier. It was a great time to be studying psych at that time. I still practice these techniques on and with myself. I am aware of the Secret being from another author and another time, however fresh and good the movie was. They are all powerful and beneficial, and all made big money, too. I would like to be an affiliate..
Could you let me know if you have an active affiliate program? I would like to look into the homeopathic imprinter could you please lead me to where I can get information on this . Hi , Can you plug a 606 laser into a scenar cosmodic device ?